11:19 PM: Boyle reports People were allowed to leave the Orioles’ Stadium at the end of the extra-innings game, right after Baltimore hit a walk-off home run. Seconds earlier, an announcement came over the loudspeaker at the stadium telling fans they were no longer going to be kept in the stadium. 9:58 PM: Investigative reporter Matthew Boyle reports that both he and a family member both tried to escape the scene of destruction and chaos, but were prevented by a forcible lockout. No one is allowed to leave Oriole Park at Camden Yards. There are at least 15,000 people trapped in the stadium — and it’s the bottom of the tenth inning. 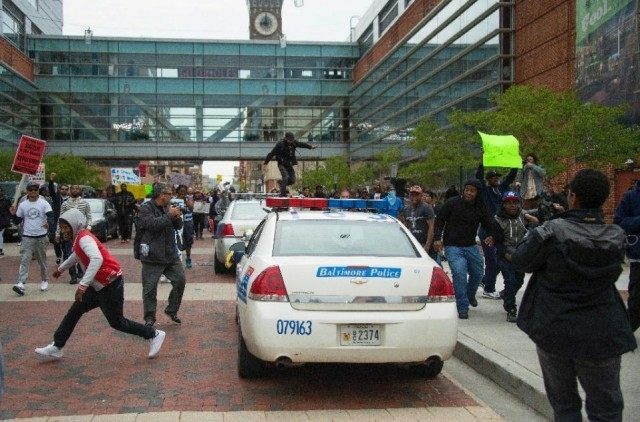 Baltimore (AFP) — Protesters smashed police cars and shop windows in downtown Baltimore on Saturday when the biggest demonstration over the death of a young African-American man in police custody turned violent. More than 1,000 people joined an orderly 90-minute rally at Baltimore city hall demanding justice for Freddie Gray, who died last Sunday from spinal injuries, a week after his arrest in the city’s impoverished west side. But the mood shifted dramatically when several scores of protesters moved on to the Camden Yards baseball stadium, an hour before the scheduled start of a Baltimore Orioles-Boston Red Sox game. Live images from local television news helicopters showed a youthful crowd hurling soda bottles and trash cans at police officers alongside the Sports Legends museum and Camden Yards ticket booths. Others were seen smashing shop windows and blocked intersections, with one motorist getting a rock through her car window, CBS affiliate WBAL reported. Five police cars were seen by an AFP photographer getting their windows smashed, before riot police moved in. Tensions have been simmering in the blue-collar Mid-Atlantic port city of 620,000 as investigators try to establish the circumstances that led to Gray’s death. Speakers at the city hall rally called for President Barack Obama to launch a national inquiry into police misconduct, following a series of fatal confrontations between white police officers and African-American men and boys. “It has to stop. It really has to stop because it could have been any one of us,” a young male adult member of Gray’s extended family told the crowd. In a press conference Friday, officials acknowledged Gray should have received medical help at the moment of his arrest, when he was seen by bystanders — and caught on video — howling in apparent pain. They also revealed that Gray, contrary to police department policy, was not buckled into his seat in the van, which made at least three unexplained stops on its way to the Western District police station. Gray died Sunday with 80 percent of his spine severed at the neck, lawyers for his family have said. His funeral is scheduled for Monday. Six officers have been suspended with pay as the police investigation inches closer to a May 1 deadline to submit findings to a Maryland state prosecutor, who could decide to press charges. Gray’s death is the latest in a string of high-profile confrontations between African Americans and police, including the fatal shooting of unarmed teenager Michael Brown in August in the St Louis. suburb of Ferguson.